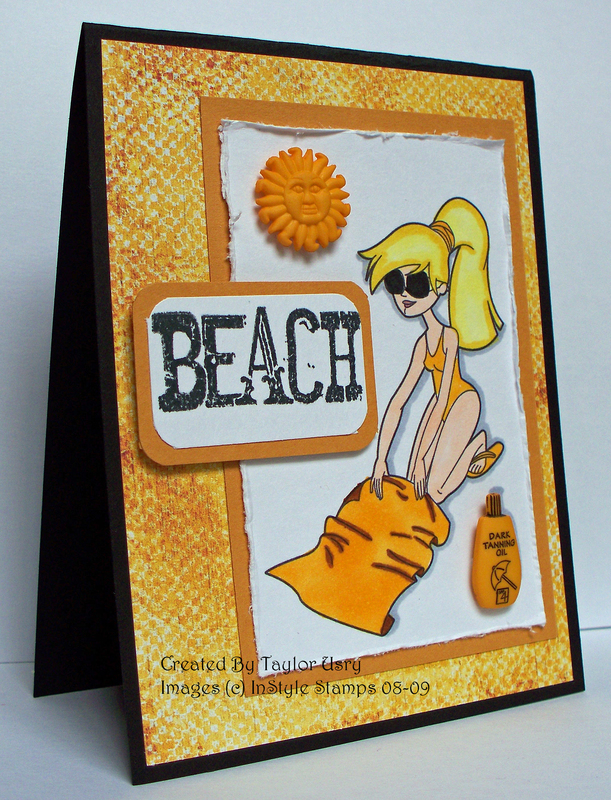 This is Beach Bunny, from the InStyle Stamps line of Beach Time Fun Digital Downloads. Isn’t she fun?? To match the color on both the bottle of suntan lotion and the sun (both buttons I purchased from Hobby Lobby in a “beachy” pack) I got out my Copics to see what would work best. On the towel, I went with my darkest yellow, an highlight of brown to match the bottle. I added an Imaginisce sentiment, stamped in Memento Tuxedo Black, to make the white space go away, highlighted with More Mustard just as my main image panel is. My dp is by Prima, from their Eire collection. My card base is Basic Black, to complement her sunglasses and the ink color on the sentiment. To get the best view of the picture, click on it to make it bigger. I really love this card! i love this, the colors and embellies are fab! Girl……….your card is super awesome! I love your cute image and the embellishments and texture work well together! Taylor she is gorgeous! You did a fantastic job with Beach Bunny! Very cute! That is just too cute!! How cool for a bottle of suntan lotion!